Mole Valley Valves - Edinburgh Fringe Reviews: Freedom! I was informed recently of an Emu comic strip that ran in the 70s. Enquiring further I was told that what usually happened was that Emu would get himself into some scrape and at the end of the strip Rod would turn up and sort....HANG ON....REWIND....at the END of the strip Rod would turn up? Rod wasn't with Emu throughout? Apparently not! This struck me as just plain wrong. Emu without Rod was unthinkable! 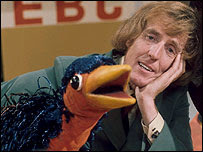 I am assured that I missed the glory days of Rod and Emu and that the Emu I remember, the petulant child clinging to his "mother"s skirts, only awakening to nip or punch another child before returning quickly to his sulks, is a pale shadow of the late 70s Emu who was a lot of fun! Whatever, he had a go at miserable old "professional journalist" Michael Parkinson, who obviously hates all mention of the incident, so good luck to him, and the much missed Rod. I used to be a big fan of the Pink Windmill Show (plenty of clips available on YouTube for a Proustian nostalgia rush) and always preferred Grotbags, Croc and Robot Redford to Rod and Emu anyway! Let's go round again ! "A brilliant bunch of guys"
"It smelt like a Sunday show to me..."